Contains Shea Butter, Aloe, Silk Amino Acids, Sunflower & Coconut Oils. 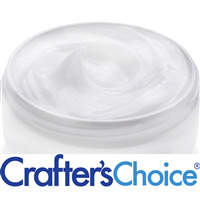 Shea and Aloe are well known in helping moisturize and repair skin damage. Sunflower Oil is rich in Vitamin E, a natural anti-oxidant. Silk Amino Acids provide a protective barrier and silky note to the lotion. Packaging in Jars: Measure base and place in a mixing container. On low heat, warm base to 120º F or until it becomes liquid. Add cosmetic grade fragrance and FDA approved color additive. Max fragrance load is 4% and 1/3% for essential oils. Pour into container. Allow to return to room temperature and apply top. Label per FDA label requirements. Packaging in Bottles: This base is too thick for a bottle. "Satin and Silk Lotion Base 5 gallon"
COMMENTS: I still haven't mastered lotion making yet, so I have used bases since deciding to offer lotions in my line. This base was an immediate hit with my customers. They (like me) love the fact that it is 97% natural and is not short on skin loving ingredients. The creamy and thick consistency is a wonderful moisturizing alternative for customers who find body butters too heavy. And a little goes a long way. I also like the ease of use and that the base takes fragrances well. It's a little pricey, but definitely worth it. "satin & silk lotion base"
COMMENTS: My customers love this lotion and I hate the expense of it but it makes good returns on my money. COMMENTS: This has a great feel and absorbs nicely without leaving a greasy feeling. Customers love this and come back asking for more! Unscented or scented, it has been a best seller. COMMENTS: My customers and I love this base. A bestseller for me :). "Perfection in a 5-gallon bucket"
COMMENTS: This was just delivered this morning and I couldn't wait to start working with this lotion base. It takes scent well and is the perfect blend of soft and silky, absorbs into skin well without leaving a residue (greasy or otherwise), and is easy to work with. I am going to use this more for lotions and feel my customers are going to love this. Thanks WSP for another great product. "Wow! This lotion converted me!" COMMENTS: I avoided lotions/creams personally because they never hit that perfect level between evaporating to nothing or being too heavy and leaving my skin sticky. THIS LOTION CONVERTED ME! This lotion has been a staple of my product line ever since. Very silky, mosturizes well, and is non-sticky. Thanks WSP! COMMENTS: I purchased this five gallon bucket without testing the product first. I was not disappointed. The large bucket although difficult to handle due to the weight was easy to open. I purchased the opening device from a local hardware store. This device made opening it easy. I would not want to try to open it without the device. The lotion was thick and creamy. It absorbed into the skin without leaving any residue on the skin. The lotion took fragrance oil and maintained the scent over an extended period of time. The cream was very thick and is slightly thinner than the silky body butter. The feel on the skin was comparable to high end products. I will purchase this again. I later discovered that the opening device is actually sold on the WSP website. COMMENTS: I've tried many cream bases and this one is the best. I receive lots of great reviews from customers. The nice thing about this base, is it is VERY thick. You can use it thick, or add water and appropriate preservative and thin it to a heavy lotion or thinner lotion. The Shea butter adds a nice touch of moisturizing. "Is this product considered Vegan? Also can I add more butters such as coffee butter to make my own coffee body butter ? Thank you so much . " Staff Answer This lotion does contain Hydrolyzed Silk which comes from the silk worm. Many would not consider that to be vegan. We would not recommend adding additional butters to this lotion as it may break down the emulsification of the lotion. "I am heating this lotion to about 110F before scenting & filling bottles. I use a plastic ziplock bag with a bottom corner clipped. This method works well, but I'm getting bubbles that persist in the finished bottles. I would like to fill with a thinner product. What temperature can I heat it to without compromising the preservative?" Staff Answer This product has a maximum heating temperature of 140°. You can find this information under "Additional Information" for this product. "As this product begins to cool, can I whip it to make it fluffier, or does it just go back to its original consistency?" Staff Answer Hi Kimberly, This product will not inflate by whipping. If you choose to try and whip the lotion, I would recommend adding an anti-oxidant. "Ingredients Question: Your description in Additional Information says this lotion contains Coconut Oils, but the Ingredients Listing does NOT include Coconut Oils. Does this produce contain Coconut Oils?" Staff Answer Cetearyl Alcohol, Ceteareth 20 and Caprylic/Capric Glycerides are all derived from coconut oil. We recommend researching the ingredients in a product so that you can better understand the products you are using. "Hello. I have a question regarding the ingredients listing for a product I am making. This lotion base lists both Sunflower Oil and Aloe Barbadensis. I am adding a tiny amount of your botanical blend in lieu of fragrance or essential oils. That product's ingredients lists Helianthus Annuus (Sunflower) Extract and Aloe Barbadensis Leaf Extract. Do I need to list all four separately or are the extracts considered part of the whole?" Staff Answer All four ingredients should be listed separately. The two extracts can be added on at the end of your INCI list.